Oct. 22, 2011, 8:34 a.m. I've had a roof rack (Yakima High rollers) for a couple years now, however after moving into a place with underground parking, it's become a huge annoyance having to take bikes off before going in the parkade. It's time to look at a hitch rack. I've got a Mazda 3 hatch, and we have a dog that resides in the back, so we need quick access to the hatch so the pooch can get in and out with the bikes ON the car. 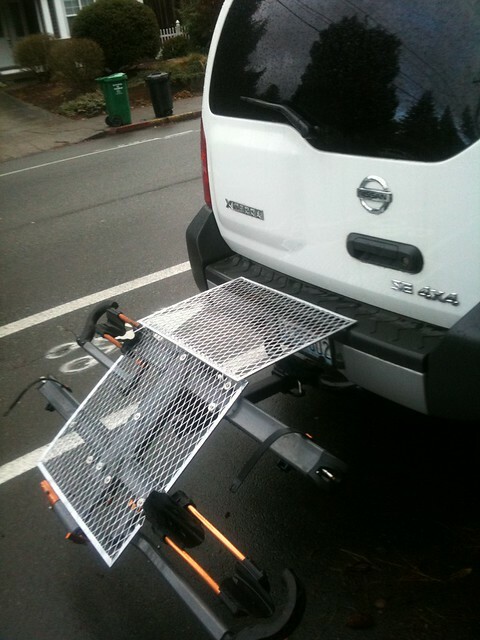 Has anyone got experience with these racks and how easily they tilt down with bikes loaded for access to the tailgate? It would be nice to have the same key system as the Yakima roof racks we've got, however ease of tilt will likely be the biggest deciding factor. BTW- North Shore Bike Rack is out because we've got road bikes we want to carry sometimes as well. Oct. 22, 2011, 6:02 p.m.
Can your dog jump across the rack when it's down? Mine can't so i needed a rack that I could hang the bikes from the top tube. Those can scuff the bike and shock if you aren't careful but the Kuat version I have does tip out the way easily and comes off with a wing nut so it requires no tools. The tray type are preferable because they grab the tire and clamp one wheel. But not perfect either if both bikes are the same size because bars interfere with the saddles of each. Sometimes even with the saddles dropped. And the dog can't jump into or out of the back when it's there. I have a Yakima on the Volvo and it does work really well though. Very sturdy and steady. Oct. 22, 2011, 6:39 p.m. It's like a NSRack, but with a superior tire cradle which accommodates road bikes too. Oct. 22, 2011, 7:09 p.m. I'm in the same boat and looking for a 1.25 inch rack to go on my civic. Arbutus racks look fantastic, but they don't accommodate the 1.25 inch crowd. Oct. 22, 2011, 9:35 p.m.
Oct. 23, 2011, 10:14 a.m.
buddy has the kuat. I imagine it tilts far enough away from the car for a dawg to jump in/out of the back, but doing the tilt with bikes on is a little awkward, you basically have to crawl under 120 lbs. of rack and bike to reach the release. what someone else said about possible bar/brake lever to seat is/was an issue. we did a little damage to my seat driving down a bumpy gravel road. on paved roads the bikes hardly move. Oct. 23, 2011, 3:02 p.m.
1up USA racks are good. Easy to tilt with bikes on. Oct. 23, 2011, 5:05 p.m.
Hey, first of all you need to know that your Mazda3 hitch can only take a 2 bike maximum. Any more and you seriously risk popcanning your frame. The Thule is a great rack, I'd pick it over the Yakima, but it's a long way out for a dog to jump out. I'm not sure it's going to work all that well for you. Frame racks are a real hassle for anything but a standard oldschool hardtail though. Either way my vote goes to the Thule. I worked for 4 years at Rack Attack, I like to think I know at least a thing or two about racks [=. Oct. 23, 2011, 10:25 p.m. Thanks Atari, I have no intentions of taking more then 2 bikes on the hitch as I will keep the roof rack for additional space if needed. With the tray style hitch racks- can a dog realistically get out on the side (not going all the way over the rack) when it's tilted down? I don't know anyone with this type of set up to test out personally, and shops rarely have them set up in-store. Oct. 24, 2011, 9:29 p.m. The rack flips down far enough, I can get my tailgate open with bikes on the back, even with 760mm bars. 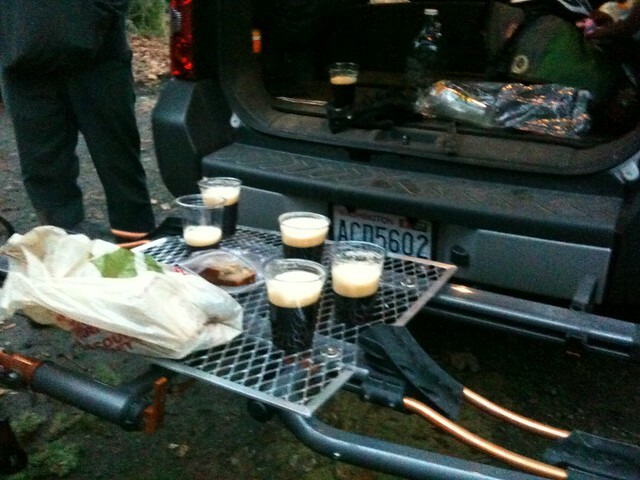 The Kuat rack makes a pretty good platform for a DIY dog-ramp/camp table. Fabbed this one up with parts from the hardware store for about $30. Kuat customer service has been legend. Not only have they warrantted a few things that I had issues with, they asked for pictures and details so they could revise their design to eliminate potential problems. Most of the issues were arguably my fault anyways (off-roading). The lock and bike stand are also cool features, but I very rarely use the bike stand. Also nice that the Kuat is aluminum (doesn't rust, and light for removal [HTML_REMOVED] hauling into the garage). So about the ramp; my german shepherd developed a limp after repeatedly jumping out of the back, so that's why I made that ramp. I throw a towel over it when we use it. The height of the xterra is a big jump down for her, and certainly not one I'd encourage her to make with bikes on the back… your mazda might be different. PS, her limp went away once i quite asking her to jump in [HTML_REMOVED] out. Oct. 25, 2011, 5:07 p.m.
What a great idea for the ramp! Rack Attack in typically has a couple of those racks built up, but it's getting into board season now. But they have them you can pull out and try on your car. Just ask the boys, they'll be happy to help. Oct. 26, 2011, 3:08 p.m. I bought a T2 from rack attack, and initially I was very impressed. Now I don't have much confidence in it, the ratchet mechanism has "jumped up" a couple teeth on me a few times, and it never seems to hold my front wheel securely (either its too loose such that it wobbles a ton, or i can't get the ratchet to engage because theres too much pressure, and it will just jump back). Whats wierd is that I have a roof-mounted Thule Side-arm (I think?) with the same mechanism, and it feels like it has much higher resolution and security. Although, the Side-arm has been used less as I haven't owned it as long (1.5 or 2 years for the T2, 6 months for the side-arm). Also, apparently the Thule lifetime warranty requires some sort of visual defect, such that Rack Attack can send visual proof to Thule for a warranty claim.